If you prefer your knife in basic black, this one just might be your perfect EDC. To create this matte-black look, Kershaw engineers ionize metal and deposit it on both blade and handle as a microns-thin coating. This process results in a coating known as DLC, or Diamond-Like Carbon, which is hard and scratch resistant. With its 3-inch blade, the Leek is a good-sized knife, but not too big. With its 3-inch blade, the Leek is a good-sized knife, but not too big. The slim design makes it easy to carry and its razor-sharp blade of high-performance Sandvik 14C28N means it can take care of a full range of cutting tasks. The blade is a modified drop-point, so it&apos;s a good slicing knife, while the slim tip gives it piercing capability and the ability to do detailed work. 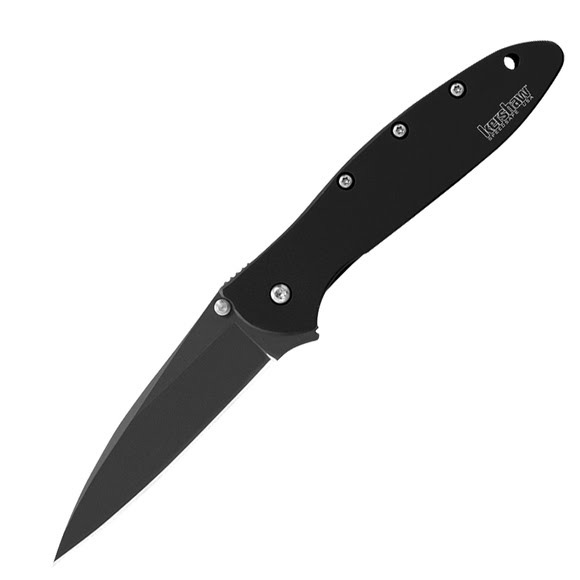 For a partially serrated blade, choose the 1660CKTST Leek in basic black. The Leek features the SpeedSafe ambidextrous assisted opening system. Whether you&apos;re left-handed or right-handed, just pull back on the blade protrusion or push outward on the thumbstud and the Leek&apos;s blade is ready to go to work. Assists you to open any SpeedSafe¨ knife quickly and easily with a manual push on the thumbstud or pull back on the flipper; built into many Kershaw best sellers.